Choose a method for unlocking your screen. 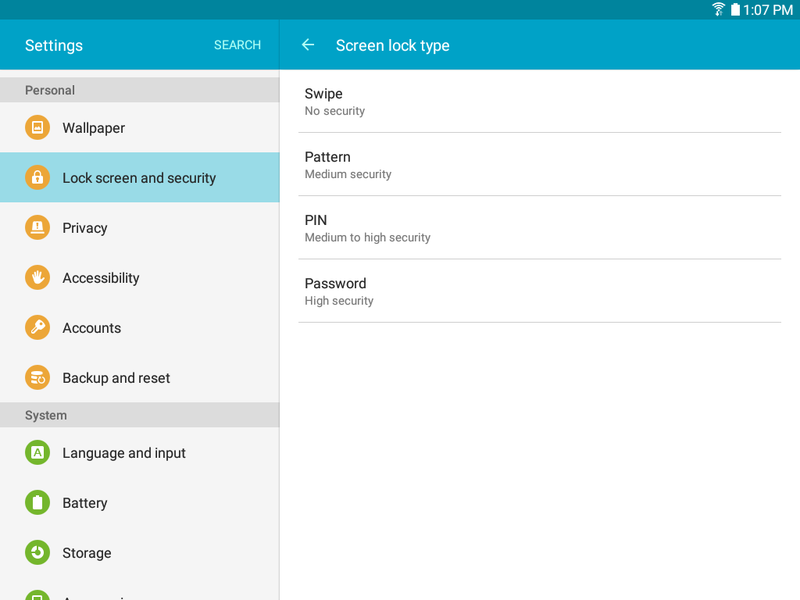 Different Screen Locks have different levels of security and options. The provided information refers to the devices sold in Canada. Screens and settings available may vary depending on your Canadian wireless service provider and your software version (Android 5.0 Lollipop for this FAQ). 2 Scroll down and touch Lock screen and security under the Personal tab. • Swipe: Swipe the screen to unlock it. This option provides no security. • Pattern: A screen unlock pattern is a tap gesture you create and use to unlock your device. This option provides medium security. • PIN: Select a PIN to use for unlocking the screen. This option provides medium to high security. • Password: Create a password for unlocking the screen. This option provides high security. 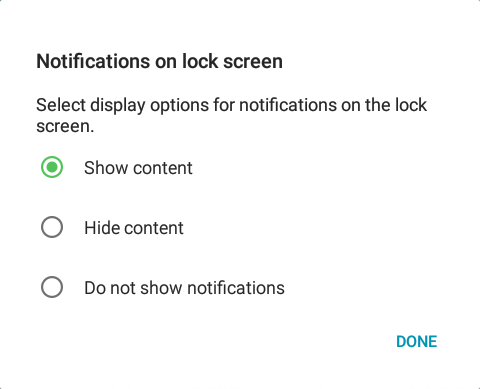 After choosing a screen lock type, you can select whether to show or hide sensitive notification content on the lock screen. 1 Touch Show content, Hide content, or Do not show notifications. • Show information: Show the dual clock, or information such as the weather information, on the lock screen. - Lock automatically: Set the time after the screen is turned off to enable the screen lock. - Lock instantly with power key: Touch the ON/OFF switch to enable or disable locking the screen immediately when pressing the Power key. - Smart Lock: Set your device to stay unlocked when you have trusted devices connected or when it’s in a trusted place. Options vary based on the screen lock type. Galaxy Tab S3 - What can I do if I forget my screen lock password, PIN or pattern (SM-T820)? 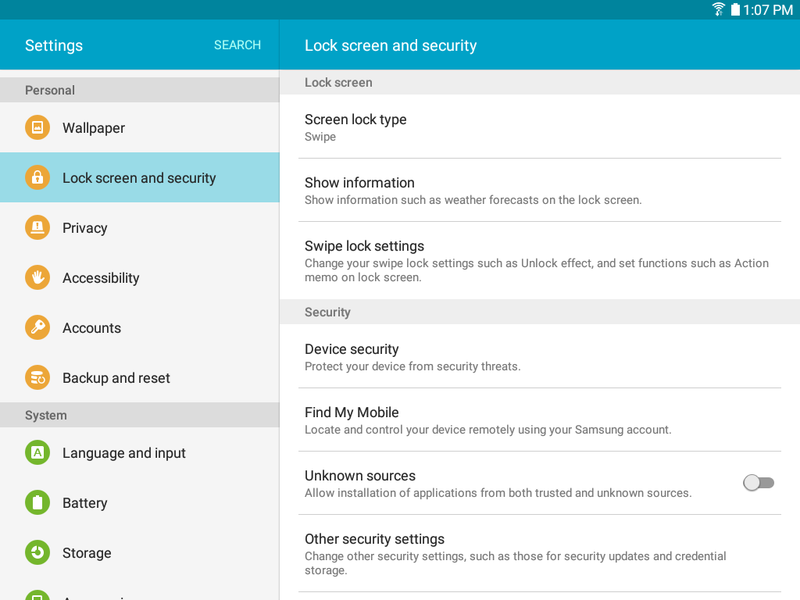 Galaxy Tab S2: How do I change the screen lock type on my Samsung Galaxy Tab S2?